Carousel Theatre for Young People is bringing back the highly popular A Charlie Brown Christmas, which will be playing in a special double bill with You’re a Good Man Charlie Brown. Tickets Available online or (604) 685-6217. Adults: $35; Seniors/Students: $29; Young People (Ages 3-18 years): $18. School group matinees available. 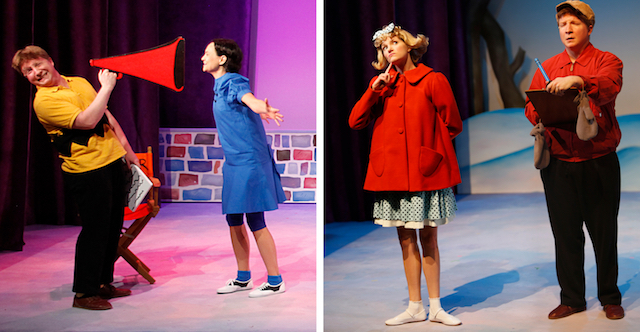 A Charlie Brown Holiday Double Bill is recommended for ages 3+. Experience the ups and downs of everyday life with Charlie Brown and his friends in You’re A Good Man Charlie Brown. When your friends are the Peanuts gang, no day is ever ordinary, and somewhere between Beethoven’s Birthday, peanut butter sandwiches, and team baseball, Charlie Brown and the gang learn about the joys of friendship and stumble upon the true meaning of happiness. A Charlie Brown Holiday Double Bill is directed by Carole Higgins and features Andrew Cownden in the title role, with Arielle Ballance, Oliver Castillo, Steve Charles, Cecilly Day, KeAloha Noelani, Emilie Leclerc, Kevin Takahide Lee, Rebecca Talbot and Amanda Testini. Follow Carousel Theatre for Young People on Twitter, Facebook, and Instagram for more info. I will draw one winner at random from all entries at 9:00pm on Monday, November 19, 2018. Update The winner is Michelle! I would love to win tickets to the Charlie Brown Holiday Double Bill. Thanks for the contest! What a great idea for a family outing to celebrate the holidays. Charlie Brown is such a classic. Would love to win tickets and take my daughter! I love Charlie Brown – this would be amazing to see! Looking for a Christmas Play to see, trust Miss 604 to have the scoup. Have fun whoever wins. Will definitely go see this! “Maybe it just needs a little love.” Such a delightful movie! I’m sure the theatre version would be as well! We’d love this so much! This would be an excellent prize! This would be a great gift for a friend! Good Grief, what a great prize. every year I watch the peanuts xmas special! This looks like a great show! I have watched the tv animated show since it was first out! So much fun to see this play! thanks for the opportunity to win tickets! Would love to see this with my daughter! What a great way to get into the holiday spirit! Oh my, I would love to win and take my daughter! I’ve heard this is a fantastic show. Ahh this would be so amazing to see! I love Charlie Brown! I would love to win tickets for this!